An absolute beachfront Villa, situated in Pabean Beach, Ketewel Bali. Set amidst a tropical landscape and overlooking the ocean, Villa Samudra Luxury Beachfront gives a perfect serenity with spectacular view of sunrise and mount Agung, Nusa Penida and Lombok Island surrounded by rice paddy fields within millionaire expatriate Villa surrounds. Villa Samudra is a holiday rental beachfront villa in Bali. Only 45 minutes from Bali International NgurahRai Airport, 15 minutes from Sanur, 10 minutes From Bali Safari and Marine Park, 10 minutes from Keramas Surfing Beach and dolphin watch, 20 minutes from Ubud, central of Balinese culture and within minutes to other tourist attractions. Villa Samudra is blessed by large beachfront gardens, towered by coconut trees and beautiful scenery of Nusa Pedina Island just perfect for intimate weddings. Villa Samudra offers a great venue to celebrate unforgettable moments in a private and exclusive atmosphere. 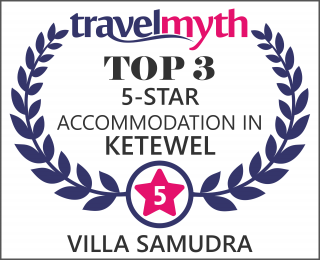 We loved our stay at Villa Samudra! This a tranquil, beautiful and exceptionally clean place to stay with dream like beds!! The interior design has been done with such great taste. A lovely mix of modern yet traditional Balinese. The tropical garden is immaculate with a huge hammock and beds looking straight out to sea. We didn't want to leave!! Fantastic and very friendly helpful staff. Thank you! Stayed at Villa Samudra for the night to celebrate a friends birthday. Fantastic view & located right on the beach. Went for lunch at Komune, but wished we had spent more time lounging by the pool. Staff were attentive, helped us prepare dinner & took good care of us. Most comfortable bed I've slept in & a great powerful rain shower! Wish we had more nights there!